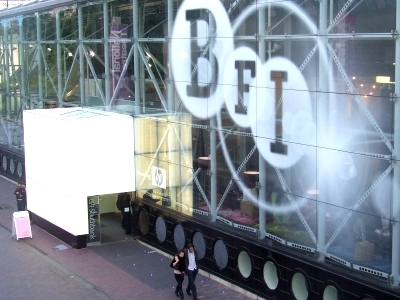 I’m live-blogging from the BFI Southbank today, where the first day of the 6th annual BFI Future Film Festival is taking place. The festival is targeted toward young film fans between the ages of 15 and 25, and features a range of in-depth masterclasses, hands-on workshops, screenings of the best new films by young, emerging filmmakers and inspirational Q&As. Much of what’s on offer has sold out, but do have a look at the website to see if tickets remain for anything. It’s a popular festival! This year the festival has expanded, taking place across three days, each with a distinct theme. Today’s is fiction, tomorrow’s is animation, and Monday’s is all about documentary. I’ve got a mixed role this year. Right now, I’m blogging from the foyer, in the middle of a pile of beanbags otherwise known as ‘Blogger’s Corner’. I’m here to offer advice and ideas to any young people who might be interested in setting up a blog, or setting out into a career of film journalism. It’s incredibly laidback, and fairly close to the set-up I have at home in my other life as a freelancer. All that’s missing is the dressing gown (and the baked beans and toothpaste smeared down the front). I’m right next to Harry Harris of FilmClub UK, and you can talk to him about the film club services they offer to schools and young people countrywide. Earlier I hosted an onstage interview with the very talented young director Rob Savage following a screening of his accomplished debut film Strings (which he made at the terrifyingly young age of 18). Also present onstage was co-lead actress Hannah Wilder. The film went down a storm with the healthy crowd in NFT2, who asked some probing questions. Rob discussed such varied topics as his early immersion into life as a filmmaker, keeping to a very tight budget, and touring the film, while Hannah discussed her life as a young actress, and what it’s like to see yourself up on screen. The day continues with a host of practical workshops, and right now, a screening of Saly El-Hoseini’s cracking drama My Brother The Devil upstairs in NFT3. This entry was posted in Bits and pieces and tagged 15-25, beanbags, BFI Future Film Festival, BFI Southbank, blogging, film, filmclub, liveblog, strings on February 16, 2013 by Ashley Clark.